For my project, I made a tea box and card set - just in time fo Mother's Day! I used the Spellbinders Nested Tea Cups die to cut out the small and medium tea cups and used my copics to color in the flowers and then distressed the edges with some Tea Dye ink to give it an old china feel. 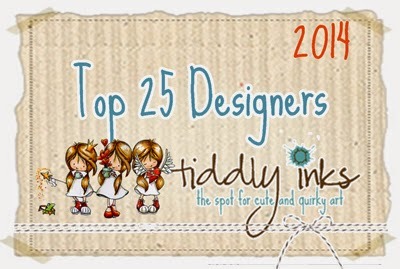 I created the patterned paper using two of the stamp sets in the collection. 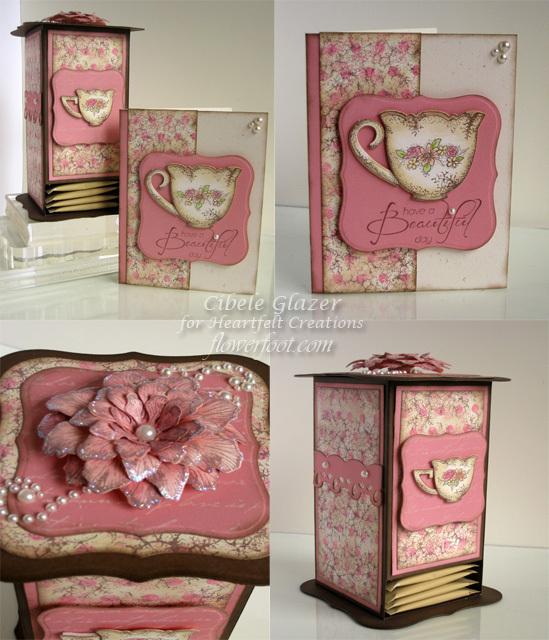 I used the Tattered Blossoms stamp and matching die to create the beautiful flower on the top of my box. I sponged some Inka Gold Rose onto the flowers and added a little glitter to the tips of the petals for some added sparkle. I have included the instructions on how to make this project below. 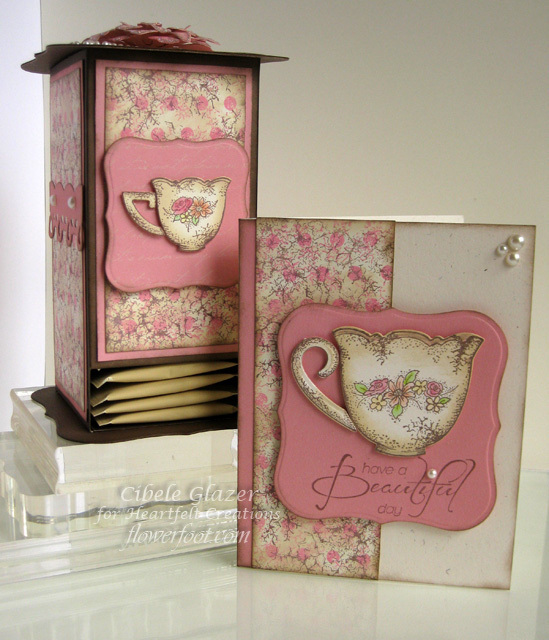 You will also find a link to my tutorial on how to make the tea box. 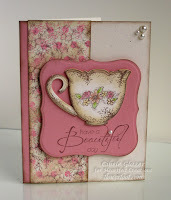 I hope you will visit the Heartfelt Creations Blog to see what all the other Design Team members did with this gorgeous set. You are sure to be inspired! 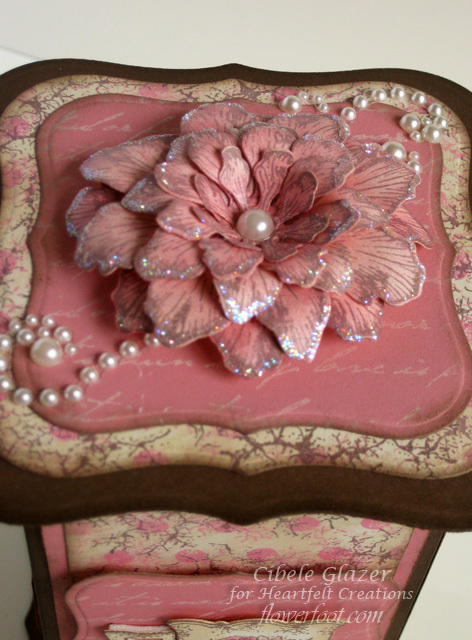 Cut card base to 4.25” x 5.5” from Rustic Cream cardstock and sponge edges with Chocolate ink. Cut a strip of Blush cardstock to .5” x 5.5” and sponge edges with Chocolate ink. Attach to far left side of card base. Cut a strip of Colonial White cardstock to 2” x 5.5” and stamp randomly with polka dot image from Tattered Backgrounds using Pink Lemonade. Using Memento Rich Cocoa, stamp distressed image from Broken Cinder Blocks over polka dots randomly. Sponge entire panel with Tea Dye ink and sponge edges with Chocolate ink. Attach to card base leaving .25” of Blush cardstock showing on left edge. Stamp middle tea cup from China Fragments with Memento Rich Cocoa and cut using coordinating Nested Tea Cups dies. Color with copics and sponge lightly with Tea Dye ink. Highlight centers of flowers and rim with glitter pen. Cut and emboss Labels 1 nestabilities and stamp sentiment from Heartfelt Expressions along bottom; sponge edges with Chocolate ink. Attach to card base using foam dimensionals. Attach tea cup to panel with foam dimensionals. Embellish with adhesive pearls. The tutorial for this box can be found HERE. Create background paper by stamping randomly with polka dot image from Tattered Backgrounds using Pink Lemonade. Using Memento Rich Cocoa, stamp distressed image from Broken Cinder Blocks over polka dots randomly. Sponge entire panel with Tea Dye ink. 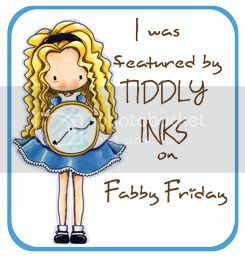 From Blush cardstock, cut emboss small Labels 1 die and stamp with Large Elengant Words Background stamp in Colonial White craft ink. Sponge edges with Chocolate ink. Cut one size larger Labels 1 from Blush cardstock and repeat previous steps and set aside. Cut next larger size Labels 1 from patterned paper and sponge edges with Chocolate ink. Stamp and cut small tea cup and color with copics. Sponge lightly with Tea Dye ink and highlight with Sakura glitter pen. Using foam dimensionals attach to smaller Labels 1 die cut. 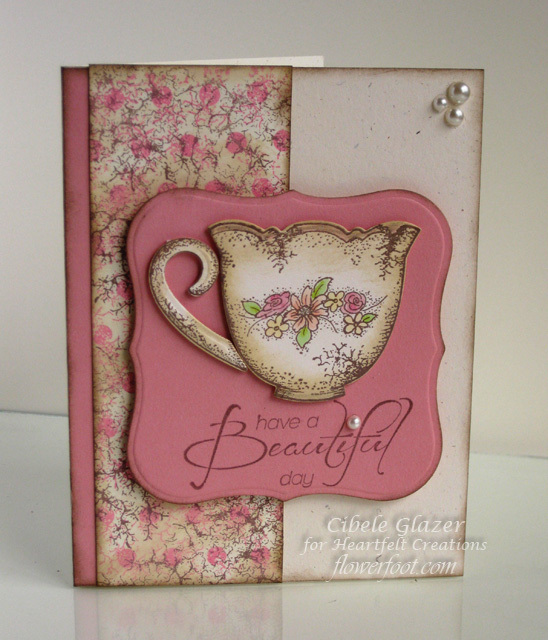 Cut 3 borders from Blush cardstock using the Butterfly Borders die and sponge with Chocolate ink. To create flower, Stamp two and cut two of second largest Tattered Blossoms die from Colonial White cardstock and one each of the smaller sizes using Rich Cocoa ink. Sponge Sweet Blush ink onto all flowers and then sponge Rose Gold Inka Gold onto flowers. Shape and layer and add glitter to tips using Dries Clear adhesive. Assemble box and embellish with adhesive pearls. What a wonderful project! I can see a very happy Mom on Mother's Day - absolutely beautiful! Very, very pretty! Nice job! Cibele, all I can say is maybe a triple WOW!FANTASTIC!!! Love that DP and these beautiful projects! Beautiful... would be nice to get it for my birthday :) It's tomorrow.